What does it take to be one of the top airlines in the world? To start, impeccable service, low prices, and a high customer satisfaction rate. Skytrax, the World Airline Survey company, compiled the opinions of over 13 million customers in order to determine the top airlines from around the globe. Here are the top 7 from their list of the top 10. 1. Singapore Airlines – This international airline flies more passengers than the entire population of its country each year. The proud iconic airline of Singapore tops many lists but surly its crown jewel has to be that of its satisfied customers. With more happy travellers year in, year out Singapore easily tops the list over any other airline. 2. Cathay Pacific – The top-ranked Asian airline, according to Skytrax. 3. Qantas – This airline has repeatedly scored well due to its great customer service. 4. 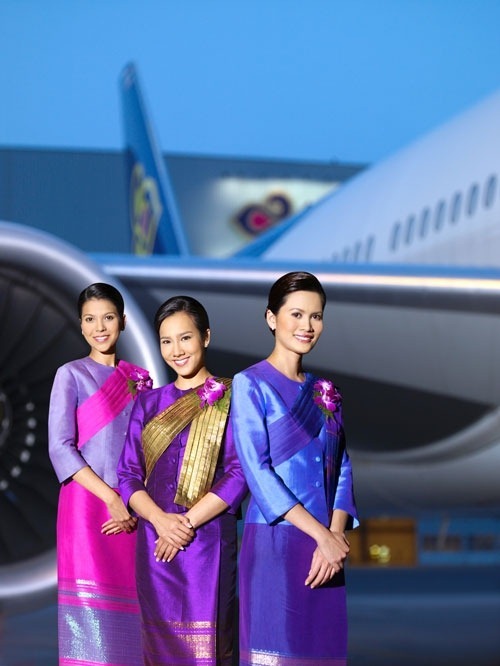 Thai Airways – This airline is known for its great inflight service, and its friendly flight attendants, who wear traditional Thai clothing during the flights. 5. Asiana – This Star Alliance airline flies to over 50 cities in 17 countries. 6. Malaysia Airlines – The airline’s red-and-blue logo represents equilibrium, a great steadying force for an airline. 7. 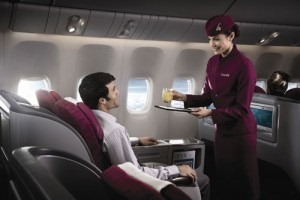 Qatar Airlines – Although young in the business (less than 15 years old), this airline has gained attention for its great customer service reviews. Singapore Airlines topped the list, due in part to its reputation for incredible in-cabin service. Interestingly, absent from the list is any American airline. Clearly, Americans are not dominating the global airline front in terms of customer satisfaction. It should be important to all airlines to ensure their customers are consistently satisfied. Flying should be a pleasure, and on board, customers enjoy being comfortable and entertained so that their flying experience is pleasurable and as quick as possible. In the case of delays, customers desire attentive service and want to feel as though the airline attendants care about their case. Today, flying can often be an arduous trek – between checking in, going through security, and waiting to take off, many customers become tired and impatient. However, a positive and attentive flight crew can make all the difference in the mood of a flight, and can cause a traveler to want to come back to the same airline again the next time they travel. In recent years, a battle has risen between customers’ desire for low-priced flights and quality service. A recent Los Angeles Times article highlights this issue, showing how airlines are struggling to contend with the battle between making a profit while reducing their rates. This seems to be a problem largely in North America, which may explain the reason why no American airlines have made the list in recent years. Airline customer satisfaction is down in North America, largely due to rising costs and a lower quality of service. Customers’ number one complaint? Extra fees for checked baggage. In airlines’ effort to make a profit, they are causing their customers to become majorly dissatisfied. If customers are dissatisfied with their airlines service, they can easily file a complaint through the Department of Transportation’s Aviation Consumer Protection Division (ACPD). However, it should be every airline’s hope and wish that no customer would ever have any need to file a complaint with their airline, not only to keep their rankings up, but also because customer satisfaction should be at the height of their mission and goals. We can all agree the airline industry is at an all time low. My experience with SWA yesterday restores my faith that someone cares about passengers. A four hr delay at Midway – airport staff were apologetic and sincere, the crew were accommodating, and we received an unexpected $100 voucher. SWA used to be the cheapest but the fares have gone up. I believe to cover free baggage. But in our case it was cheaper because the fees on the other airlines made their flights higher. I know their are a lot of complaints about seats. I used to hate SWA for that reason. I also don’t like that the 24hr checkin still gives you only an A30 at best since they sell the first half of the A seats now for business select or a fee. But if you check in early you still have a good selection. The other airlines are sneakier. You may get an assigned seat but do you really have a choice? Most of my recent flights have shown me a chart selection of all centre seats and the aisles and windows for sale! Not a good way to build loyal customers. "Martha Stewardess" is a fictional character. Any similarities to persons alive or dead are purely coincidental. Martha's life partner "Chip" is a fictional character too, existing only in the mind of the author and creator of Marthastewardess.com . Any similarity to a ventriloquist dummy (alive or not so much) is also a coinkidink. In other words, they're not real. The airline Martha's creator flies for is a guarded secret. In fact, she/he may not even fly for an airline at all. Who kows? The real person behind Martha might work at the DMV, Krispy Kreme Donuts, the even the CIA. Please be advised that any comments or opinions expressed by Martha are probably nothing more than Chip's off the cuff remarks, and not at all associated with or representing the non-fictional airline Martha (or Martha's creator) may or may not work for. After all, imaginary Chip is a dummy. The information provided here is haphazard and tossed together with salad tongs and a prayer. Yes, there may be typos and grammar goofs. Blame Chip, he's the 'goof' proof reader. Remember, what you might interpret as a 'typo' may not be a mistake at all. But then again, maybe it is. However, please understand that some articles are provided by news sources outside of the U.S.. We're asking that you think outside of the box, or maybe even the country. The author is not aware of any copyright issues or violations. Unless otherwise noted – all photos were found on 'creative commons' under the creative commons license, whatever that is. Please give our advertisers a run for your money. We are very selective with the types of advertising, services, and products offered here. And we truly appreciate you giving them the business. Click on any of our ads or ad links. Looking is absolutely free! This blog is for entertainment purposes only. Please address complaints to our complaint department, Attn: Chip. Thank you. Now, sit back-relax-and enjoy your time with us as we climb to a comfortable cruising altitude of 34,000 feet! Copyright © 2019 Martha Stewardess Living at 34,000 feet. All Rights Reserved. The Magazine Basic Theme by bavotasan.com.